527 CMR and 780 CMR both require every outside opening accessible to the fire department that opens directly on any hoistway or shaftway communicating between two or more floors be plainly marked with a sign. 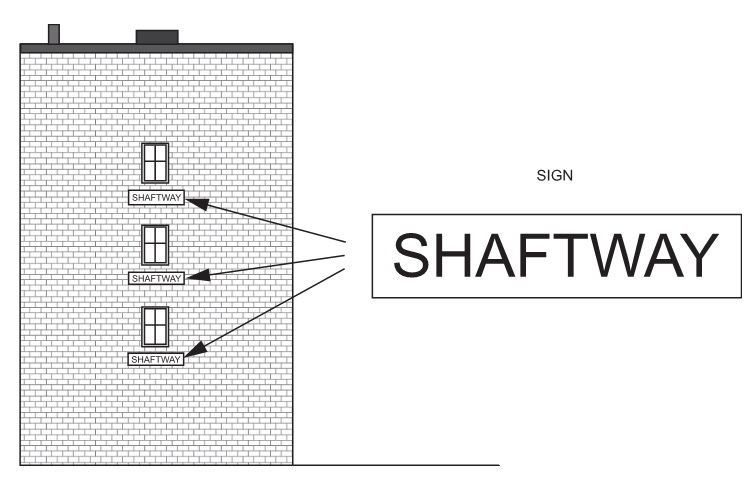 The sign must have red letters on a white background that reads “SHAFTWAY” with letters that are at least 6 inches high. All required signage must be readily visible from the outside of the building. The purpose of the requirement is to warn responding personnel that such openings would be unsafe for landing a ladder on or gaining access through. The applicable requirements are found in 527 CMR 10.11.2 and 780 CMR 914.1. The figure at left is taken from the 2015 IBC Code Commentary – Volume 1, Figure 914.1.1.